Pallets boards are of different kinds and come is so many different sizes so one can choose the according sizes of them just to lessen up his construction work! Recycling of pallets becoming a marvelous way to gain furniture and our one even having no carpentry experience can do pallet furniture projects with great ease! 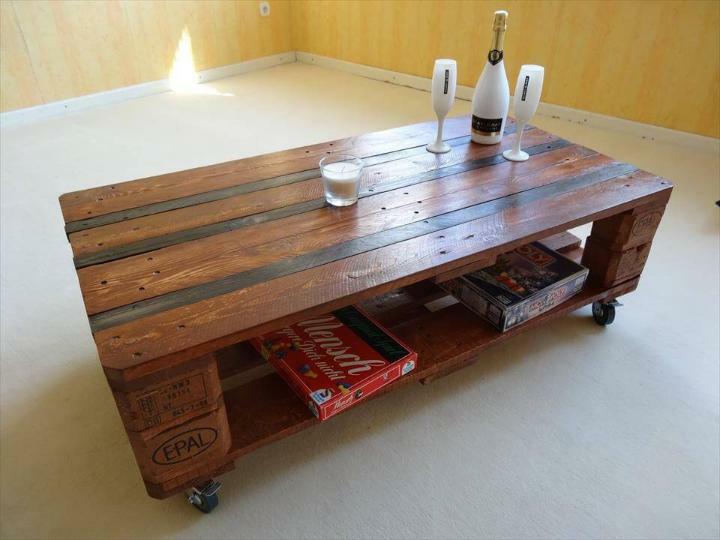 Using the perfect sizes of EURO pallets boards this wonderful recovery has been done, the amazing DIY pallet coffee table, raised on hardware caster wheels and provides secret storage options at the same time! 2 Euro pallets skids have been linked up by joining their bottoms, this creates a complete look of table which can be also be adapted as a media console in your media room! The layout of table is really graceful while the black and brown wood tones create a fab stimulating hue of it! No cutting, no dismantling, all has been done through easy and quick stacking of pallets! This is how you can avail the feasible shapes and sizes of pallets for instant DIY pallet furniture building! 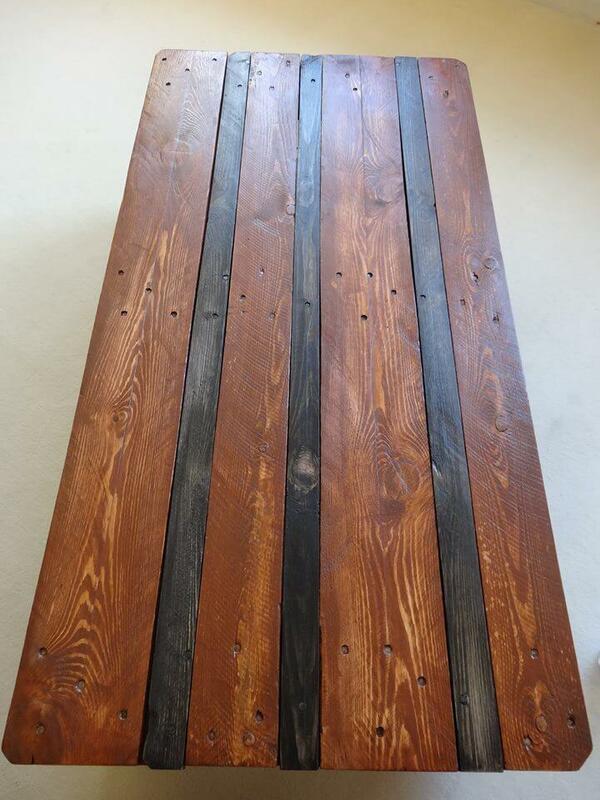 Checkout this one more perfect combo of EPAL pallet boards, a young looking robust design of coffee table, perfect to employ for a living room or select for a patio sitting plan! 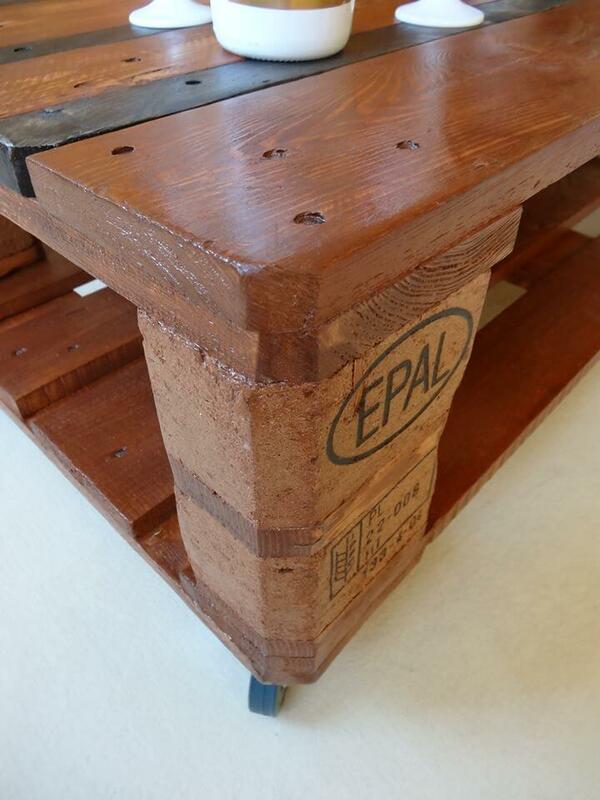 2 EPAL pallet clones have been stacked by joining their chocks or bottoms, in this way the user get some more inside space or pockets to place some items of interest while enjoying the sitting session! Table design is having black white lights as accent inlay while the rest of body has been stained in walnut that gives an amazing wood tone and also amazing weather protection to wooden surfaces! 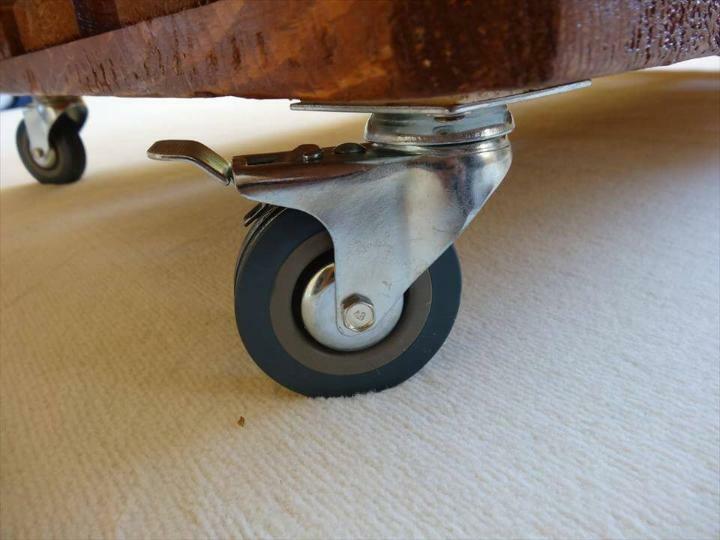 Locking caster wheels have been selected just to create a smooth and rolling movement of table on the flat home floors! Addition of hardware wheels also make the table look like industrial! One can get a more specific wood tone by varying the paint shades! Mahogany, chestnut and beeswax are popular ones in this case! Get your pallets now for easy table construction at home! Table would be a pleasure to have in your garden and for patio sitting plans and also for front porch sitting sets! 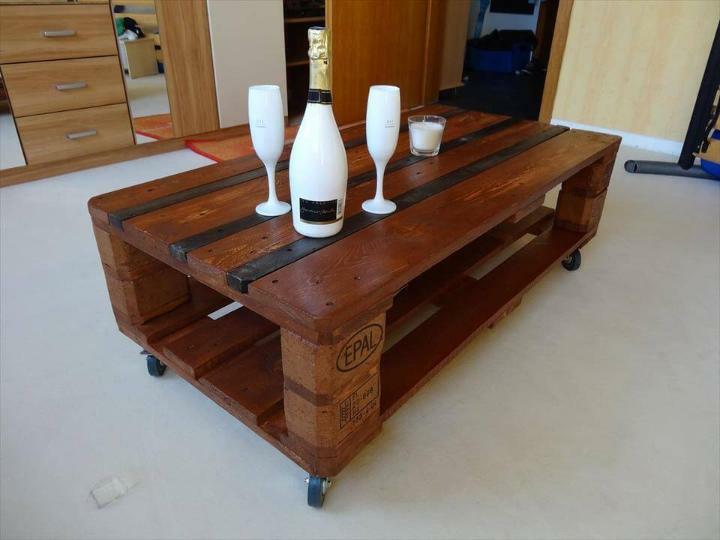 Recycle the pallets creatively and make you life more functional and up-to trends! 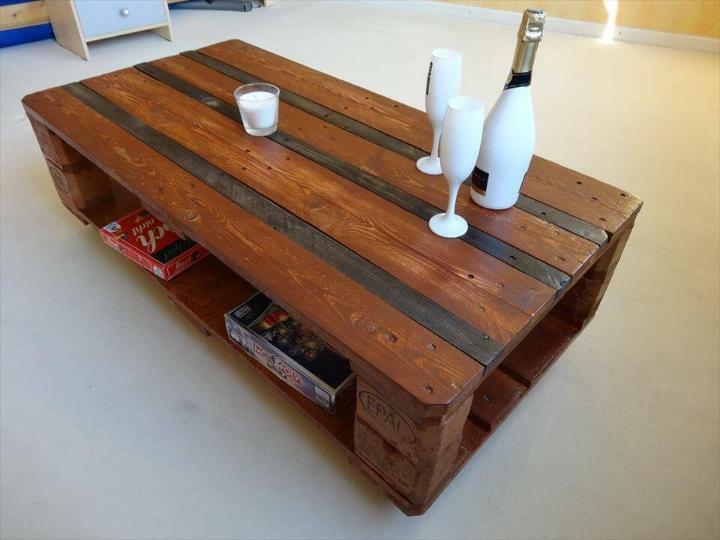 You would not such a beefy wooden pallet coffee table anywhere for free! 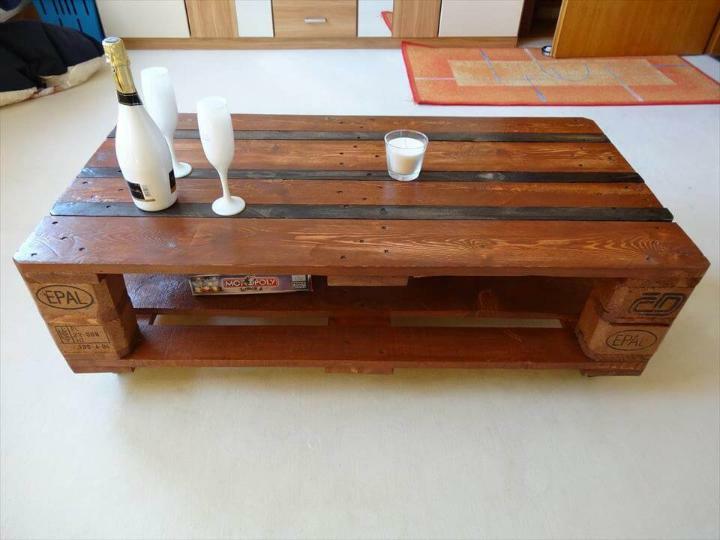 This is all possible through recycling of pallets! Make the old wood around you functional again and live more with it!